I have a mixed relationship with dairy. I was a kid who had to be bribed to drink milk, even if it was heavy laden with chocolate Quik powder. Since childhood, if I eat cereal with milk, its sole purpose is to the wet cereal. I drain the milk off every spoonful and discard what’s left in the bowl. I’m ambivalent to ice cream. I’ll eat it. In fact, a favorite summer activity is to go for a drive where the destination is somewhere to eat ice cream. I’ll never say no to the trip. For me, ice cream is a vehicle for mix-ins or toppings. I seldom order an ice cream that doesn’t contain pieces (chocolate chips, chopped up cookies, cookie dough, candy or nuts). Plain ice cream requires hot fudge. On the other hand, I could never live without cheese. I’m slightly lactose intolerant, but I’m willing to live with the side effects. 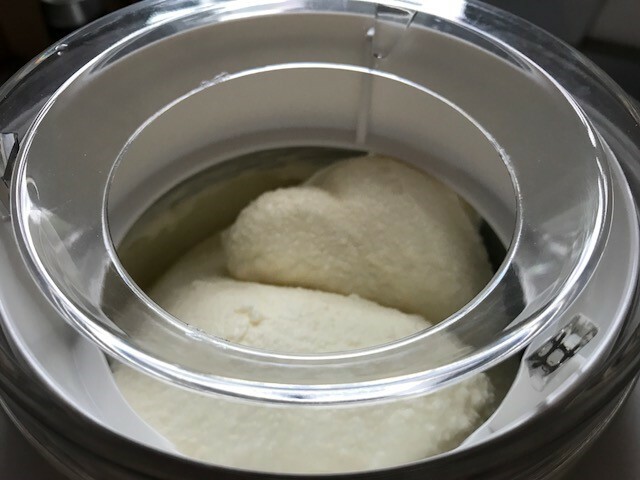 I am always enchanted by the idea of making ice cream, enough that we own an ice cream maker, though we seldom make the effort. David Lebovitz’s Buttermilk Ice Cream, this week’s recipe for Cook the Book Fridays, offered the needed excuse. This recipe was so simple to prepare. Sugar and corn syrup are dissolved in heavy cream which then chills overnight. Stir in buttermilk before freezing in the ice cream maker. 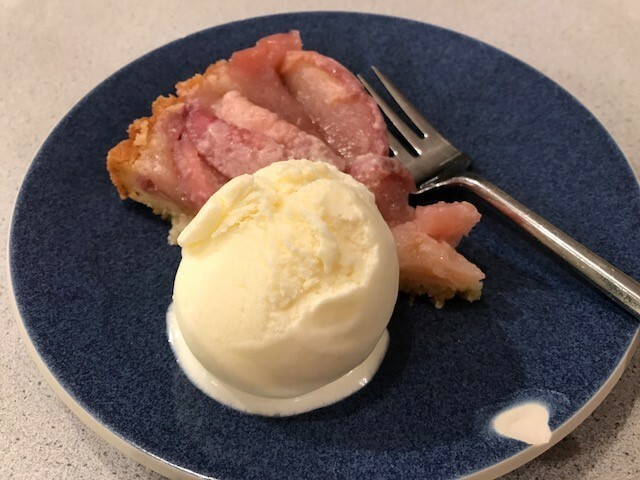 There was leftover peach tart, so rather than serve the ice cream drizzled with olive oil and salt, I served the tart à la mode. Unfortunately, it was not a hit. I’ll admit that the corn syrup helped with the iciness that my homemade ice cream often has. Another positive: the ice cream wasn’t too sweet. Other than that, neither of us liked it. It tasted too much like frozen milk, more specifically buttermilk, and not enough like ice cream. What a bummer to pour the rest down the drain. I’m guessing mine might be the minority opinion. To see whether my Cook the Book Fridays friends were fans, check out their links here. I’ve been struggling with my posts lately. There is too much going on the world at large. News has captivated my attention, and when I sit at the computer, I end up reading more and more news. In comparison, taking time to write about what I cooked or ate seems insignificant and irrelevant. I did make the other August recipe assignment on time, but failed to share the results. 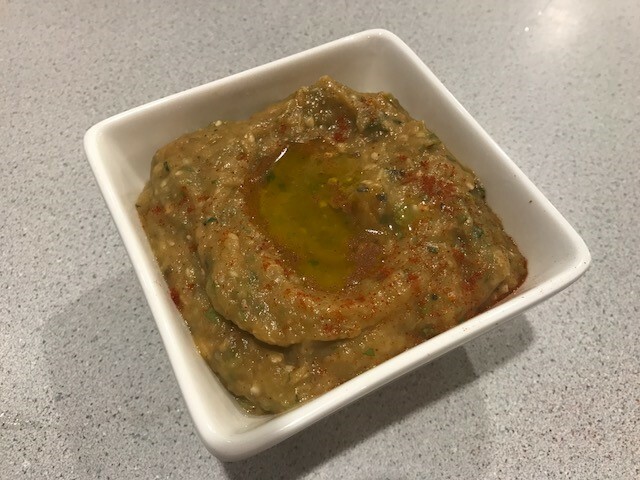 Eggplant caviar is a smooth dip, similar to Baba Ganoush but without any tahini. 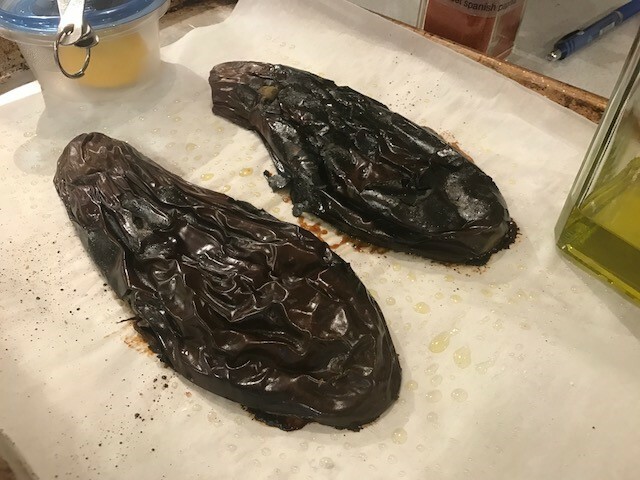 Once the eggplant is charred and roasted, it is quick to put together. Served with pita chips (and maybe some hummus), this is a nice nibble before dinner. David Lebovitz’s version is tasty, but I preferred the one we made for French Fridays with Dorie which included chopped fresh tomatoes. Others from Cook the Book Fridays share their opinions here. Here’s hoping that I’m timely in September.